Clear forms, optimum functionality and high-quality materials. TriASS is the high-quality furnishing concept from ASSMANN. It stands for clear forms, optimum functionality and high-quality materials: a design that has been reduced to the bare essentials. Simplicity replaces excess as an expression of personality. Attractive, representative and convincing at the very first glance  just like the work you produce on a daily basis. Premium product quality combined with high level functionality. With their well-designed construction principles, TriASS tables are ideally suited for team workplaces, conferences and meetings. The configurations can also subsequently be extended or rebuilt in practically endless configurations. Technical IT solutions can easily be provided thanks to the large cable duct and TURN built-in boxes for connecting data and electricity cables. 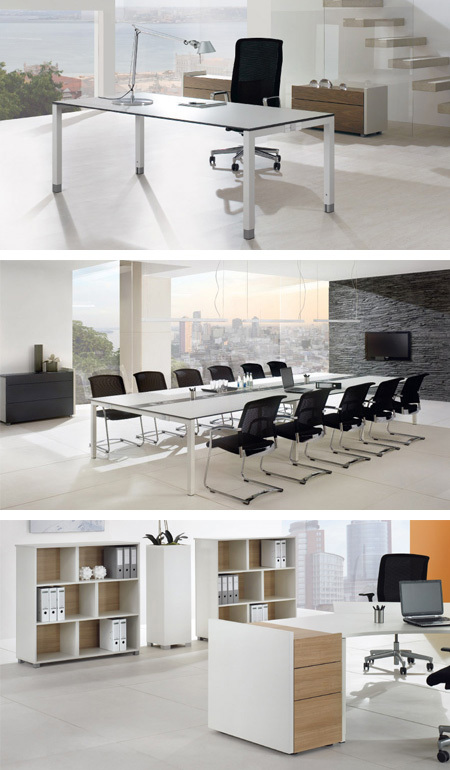 The design-oriented range of complementary furniture complements the clean straight lines of the desks. The TriASS furnishing system allows you to create an individual atmosphere in any office. All the elements in the range complement each other perfectly and have a formal aesthetic appeal. A new take on flexible rooms and storage space. Reinvents the ergonomics of office task chairs.